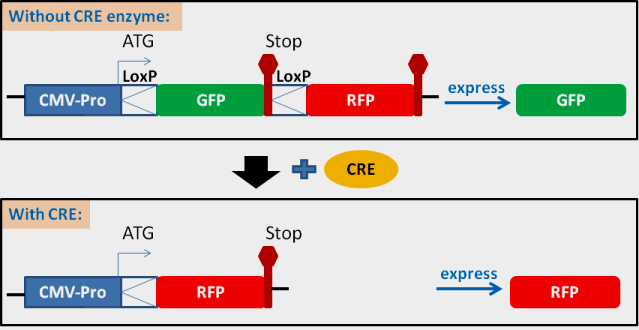 Pre-made stable cell line, derived from HEK293 cells, constitutively expresses a “LoxP-GFP-Stop-LoxP-RFP-Stop” cassette under strong suCMV promoter. The expression cassette also contains an antibiotic marker (Puro, Bsd, or Neo) under a RSV promoter. See the genomic integrated express cassette structure below. The CRE reporting cell lines are used to monitor or confirm the efficiency of CRE recombination in vivo. It is a great method and easy tool to verify the performance of your CRE enzyme (your CRE expression plasmids, or pre-made CRE expression lentivirus, or purified CRE enzyme) in vivo conditions. It is also a control test to verify your CRE-loxP based system. Note: you can use our pre-made LoxP lentivirus to build the LoxP/CRE reporting cell lines at your desired cell types, or Contact Us for stable cell line services.